Valiollah Eslami Amirabadi, visiting from Iran, right, gratefully thanks Dr.Jeffrey Dembner for restoring his health, while daughter Sedigheh Ghods watches. After Iranian doctors told Valiollah Eslami Amirabadi that he’d have to live with intense back pain, he felt hopeless. But during a visit with his daughter and her family in Solano County, the 71-year-old retired construction worker was inspired to meet with neurosurgeon Jeffrey Dembner, M.D., and his life changed. 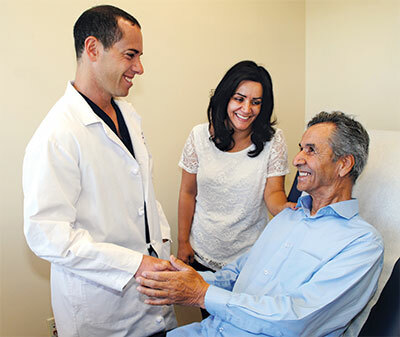 Dr. Dembner strives to offer patients the most conservative, minimally invasive procedure possible. Sedigheh’s husband, Ehsan Ghods, D.O., primary care physician at NorthBay Healthcare’s Center for Primary Care in Green Valley, had been referring patients to Dr. Dembner and was getting great feedback from them, she notes. Dr. Dembner, the medical director for NorthBay’s Center for Neuroscience, typically strives to offer patients the most conservative, minimally invasive procedure. And so Dr. Dembner did fix Valiollah’s back. Immediately following the surgery, “he said it was like night and day,” Sedigheh reports. “Except for the incision, my father was pain-free right after the surgery. Compared to what he had been feeling, that was like nothing,” she says, “He was so grateful he kissed the doctor’s hands. Now he can do the things he wants to do. He can walk, play with my children, and work in the garden.